A black and white negative of a car that collided with a steel girder on the Lynde Creek Bridge in Whitby, Ontario. 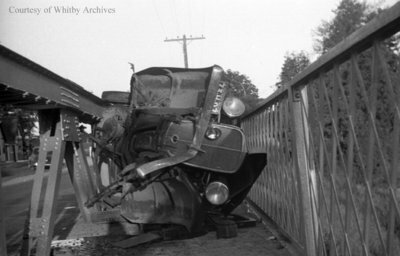 In the early hours of July 2, 1937 four residents of Oshawa, Ontario were involved in a car accident when the car they were traveling in collided with a steel girder on the Lynde Creek bridge in Whitby, Ontario. Car Wreck, July 2, 1937, Marjorie Ruddy. Whitby Archives A2013_040_169A.